When I posted the recipe to my Spiced Pumpkin Biscotti with Pure Maple Icing, you may have noticed that some of the biscotti were first dipped in the maple icing and then had candied walnuts sprinkled on them. 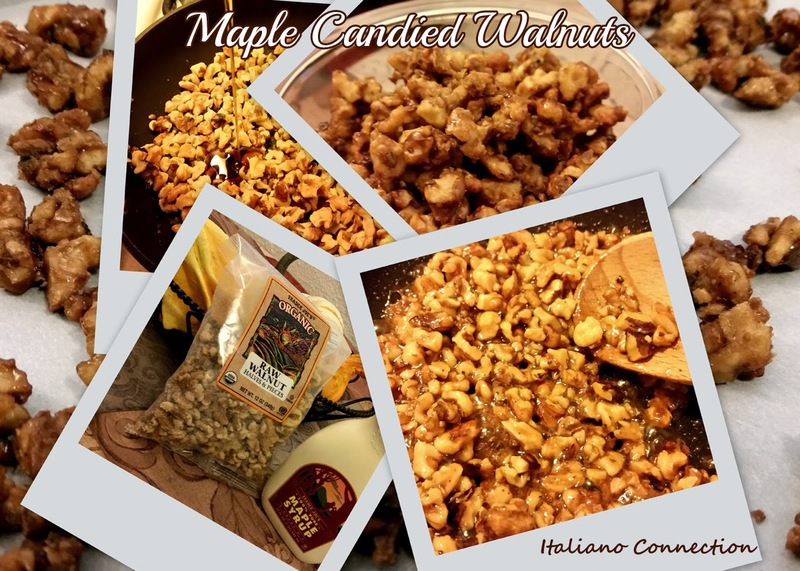 This is the easiest recipe I have ever made for candied walnuts and tastes just as good if not better. On top of it, this one is actually much healthier than the other spiced candied walnuts I used to make every Christmas. Depending on your purpose for them on how you would best use them, on how much you want to chop them. I use Trader Joe's organic walnut halves and leave them as are if I am using them to eat as is. However, for sprinkling it works better to chop them into small bits before preparing this recipe. Also, you do not have to make this much at a time. Heat a skillet over medium heat and add walnuts and sea salt. Stir them for about 2 minutes. Drizzle maple syrup over nuts in pan. Now is the time to add the optional spices as well. Keep stirring for about 3 more minutes or until syrup caramelizes. Spread onto parchment paper and use forks to separate. After cooled, store in an airtight container.